Nick Clark at the British newspaper the Independent reports that the film rights to Adam Sisman's biography of John le Carre have been optioned by the spy novelist's sons. Viewers settling in to enjoy the next episode of The Night Manager may soon get a chance to see the man behind the BBC1 espionage thriller. A biopic of the book’s author John le Carré, who worked for MI5 and MI6, could be headed for the screen. 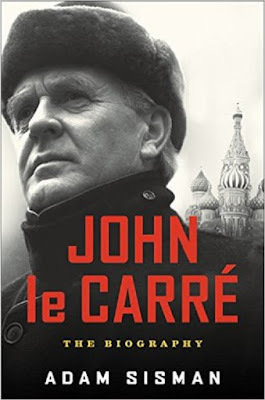 Adam Sisman, who wrote John le Carré: The Biography, told The Independent Bath Literature Festival last week that the film rights to his book had been snapped up. The Ink Factory, the production company behind the BBC’s adaptation of The Night Manager and several other Le Carré novels, has secured the rights, he revealed.